Palma is a modernist photographer. Born in Guatemala City, he studied architecture and cinematography at the Universidad de San Carlos de Guatemala, and then later turned to photography. His work has been exhibited since 1989 to present in more than 58 expositions throughout America and Europe. He is of mixed or “mestizo” background, focusing particularly on the indigenous Mayas and the mestizo people of Guatemala. His photographs often raise awareness of cultural issues. 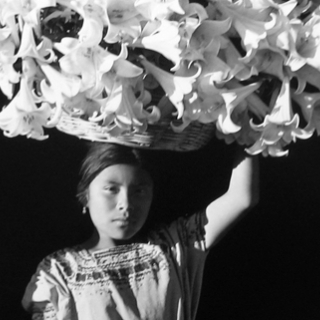 For example in his "bodyguard" series, the distant gazes and mystical costumes expose some of the stereotypes of the people of Guatemala. Symbolism is key in González-Palma’s body of work. His unique technique of leaving the whites of the subjects' eyes un-tinted in the sepia-toned photographs intensifies the gaze, and perhaps "portrays their souls". In addition, he often layers his images with text.